Supermum succeeded where the Golden Oldie failed. 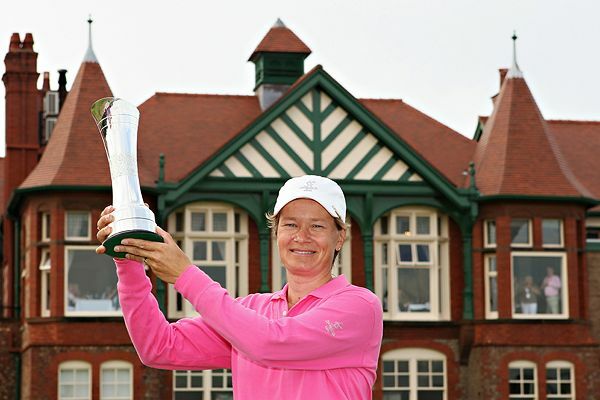 Just 11 weeks after giving birth to her second daughter, Catriona Matthew became the first Scottish female to win a major here yesterday, at the same time handing British women's golf a huge and much-needed boost. In many respects, Matthew's heroics at this Ricoh Women's British Open were just as remarkable as the age-defying run of Tom Watson at the male equivalent two weeks ago. After all, the evergreen 59-year-old could not convert his last-day advantage into the first prize. Matthew, just three weeks short of her 40th birthday, did, and did so rather nervelessly. She lost her lead, then regained it, eventually cruising home by three shots from fast-finishing Australian Karrie Webb. And then there was the rust shook off by Matthew. Due to the arrival of Sophie, the world No 64 was making only her second competitive outing in five months. The next time a pro moans about "an interrupted preparation" they should stand back while Catriona's story is thrown back in their faces. They might even need gas and air to get through it. Typically of Matthew, she managed to hold back the emotion which threatened to overflow on the 18th green when following Laura Davies, Alison Nicholas and Karen Stupples as the fourth British major winner in history. "I'm just about speechless," she said. "I had a tear in my eye coming up the final fairway but told myself to keep it together. There were some anxious moments out there and I have to thank Graeme [her husband and caddie] for helping me a lot." When asked how she had managed to prevail so soon after labour, Matthew claimed it had actually assisted her challenge. "When I had my first, Katie, two years ago, I finished second and third on my first two outings," she explained. "And this time, it was not as difficult as the first. I actually began practising five weeks after the birth. When I'm playing I don't get time to practise much so that extra time was a benefit. And although Graeme probably won't agree, I think motherhood has calmed me down on the course. Everything's more in perspective." Although the spotlight will inevitably fall on her whirlwind few months – last week at her comeback event, the Evian Masters, she and Graeme were forced to flee a burning hotel – this victory was, in fact, the product of 14 tough years as a professional. She admitted there "had been times when I questioned whether I could do it". In 2001, Matthew was demoralised after letting slip a one-shot lead in the final round at Sunningdale and again in 2007 when a third-round 80 at St Andrews destroyed a winning chance. All of these experiences proved vital in yesterday's fraught early stages. Three clear overnight, Matthew bogeyed three of the first 10 holes and fell into a tie with Japan's Ai Miyazato. But then Matthew, playing the feared Lytham back nine, sank putts of 15 feet at the 13th and 35-feet at the 14th and two-putted the long 15th for a third successive birdie. With the rivals around her suddenly falling back, the destination of the £200,000 cheque was not in doubt. At three-under, Matthew was the only member of the 144-strong field who broke par. Meanwhile, on the British front, Matthew was the only finisher in the top 30. Only four of her countrywoman survived the cut and as only Vikki Laing, 28, is under 35, the paucity of young British talent is obvious. Surely this triumph will inspire the home champions of the future. Not to mention the mums of the future. "We'll have to see about the rest of the year, but the Tour has great childcare facilities and the four of us will set off on Tour next year," said Matthew. They should prove a formidable team.